Noms! This is by far one of my favorite recipes to make for dinner. Not only is it super easy to make, but it's also incredibly healthy! Packed with loads of plant-based fiber, protein, healthy fats and vitamins, this dish seriously has to be one of the most convenient and delicious meals out there, not to mention cheap! Try it out and let me know what you think! + Spiralize both zucchinis into zucchini noodles. + Fill a large skillet with a small amount of water so that it covers the bottom of the pan. 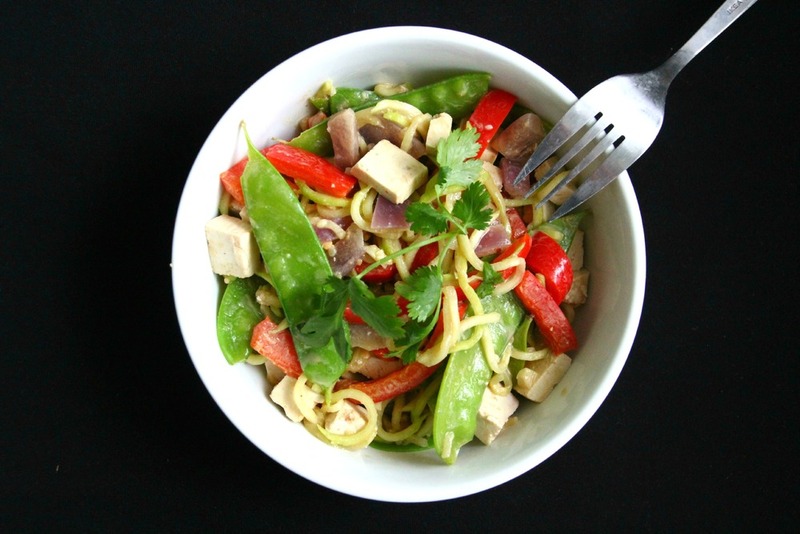 Water saute the sliced red bell pepper, onion and snow peas on high heat for 1-2 minutes or until tender. + Drain the vegetables and place them into a large bowl with the zucchini noodles (you may want to cut these first!) Add your cooked protein of choice. + Drizzle the peanut sauce over the vegetable base and enjoy!